Introduction: Although mean lung function (LF) is stable to two years in NBS CF infants (1), the extent to which LF varies within individuals over time is unknown. Aim: To investigate within-subject change in LF during the first two years. Methods: Forced Expiratory Volume (FEV0.5), Lung Clearance Index (LCI) and plethysmographic Functional Residual Capacity (FRC) were measured in CF infants and controls at ∼ 3mth, 1 and 2yrs. 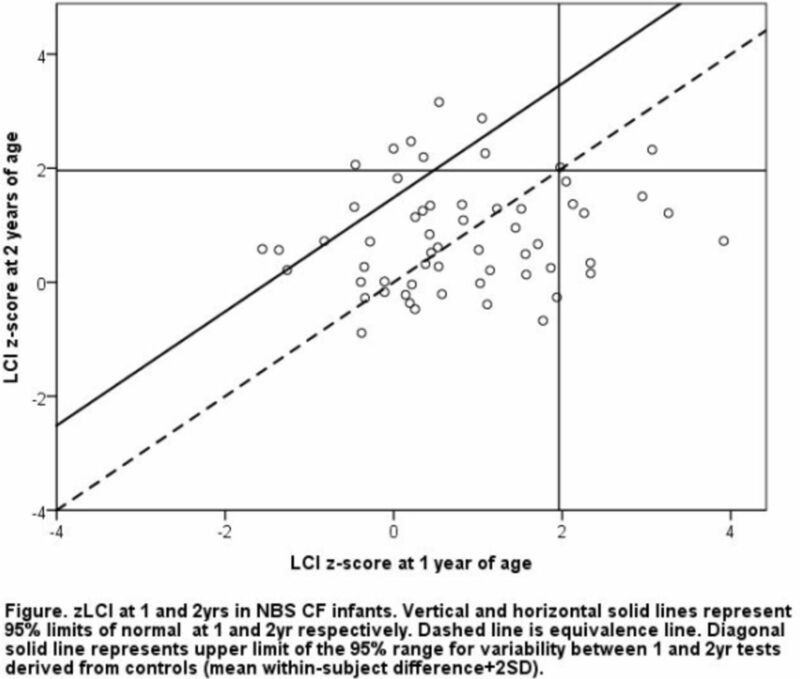 Results: Of 58 NBS CF infants, 10 had an abnormal (≥1.96 z-scores) LCI at 1yr, 8 of whom had a 2yr LCI within the normal range (Fig). Of 9 infants with abnormal 2yr results, only 2 had abnormal 1yr results. In contrast to controls, there was no association between zLCI at 2yrs with either 3mth or 1yr results. No child had abnormal zFEV0.5 at both 1 and 2yr tests. Despite significant associations between zFRCat 2yrs and either 3mths or 1yr, most infants (6/9; 67%) with abnormal 1yr FRC had normal 2yr results. The mean (95% range) within-subject change in zLCI among 31 controls with paired results at 1 and 2yrs was -0.1 (-1.8 to 1.5). 11 infants with CF had a significant increase (> 1.5 z scores) in LCI between 1 and 2yrs although only 6 of these also had an abnormal zLCI at 2yr (Fig). Conclusions: LF outcomes are highly variable over time in individual NBS CF infants, presenting challenges for interventional trial design and clinical decision making. Ref: (1) Thia et al ERJ 2013(S57).